Check Engine Light Service Salt Lake City:What Does”Check Engine”Mean? Your “Check Engine” light is on, and you have no idea why the light is on. You were simply driving down the road, and suddenly the yellow (orange, or red) check engine light illuminates on your dashboard-with no strange noises or warning symptoms. What causes the Check Engine light to go on? Like most drivers, you have no idea what the light is trying to tell you. A failure of a major electronic, fuel system or exhaust component-sensor. If the check engine light comes on and off, or only blinks temporarily, the issue may be minor or sporadic in nature. To be sure, an engine electronic diagnostic scan on the system is needed to determine the nature of the “check engine” fault. Like telling a doctor how your body feels, since you are driving the car when the check engine light first appeared, it helps to tell the auto repair diagnostic technician the conditions that occurred when the light came on. Was it just after the engine started (cold engine), or after it had been running while (hot engine)? What speed were you driving? Were you accelerating,or slowing down? What engine electrical systems went on just prior to the light on (cruise control, A/C system, heater, etc.)? If the “check engine” light is blinking or you notice any serious performance problems, such as a loss of power, reduce your speed and try to reduce the load on the engine. Have the car checked as soon as possible to prevent expensive damage. In addition to turning on the light, the computer stores a “trouble code” in its memory that identifies the source of the problem, such as a malfunctioning sensor or a misfiring engine. The code can be read with an electronic scan tool or a diagnostic computer-we have the tools to scan any make or model vehicle you drive. In most situations, if your “check engine” light illuminates don’t overreact. Although extreme problems, like low oil pressure or an overheating engine, might trigger a “check engine” light, your car’s dashboard has other lights and gauges to warn you about those problems (and most likely a lot sooner). With the Utah winter snow falling on roads in Salt Lake City and along the Wasatch Front, safe braking on snowy and icy roads is a concern that is significantly reduced with a properly functioning anti-lock brake system (called ABS) on your car. ABS systems have been installed in most vehicles since the late 1980’s. Your car’s Anti-Lock Brake System (ABS) is explained in plain language by Tim, owner of GT Automotive in South Jordan. Whether you drive an Audi (the car in this video) or any car 10 years old or newer, your brakes are equipped with an anti-lock system on either front or rear, or both sets of axles. See what you should know about your brake service in this video. Your antilock brake system is a safe and effective braking system, allowing you to maintain directional stability and control while braking and steering, and reduce stopping distances during emergency braking situation, particularly on wet, slippery, icy or snowy road surfaces. What is ABS? Why Is ABS important? An antilock braking system works with the regular or foundation brakes on your vehicle. ABS simply keeps your base brakes from locking up. In vehicles not equipped with ABS, the driver can manually pump the brakes to prevent wheel lockup. In vehicles equipped with ABS, the driver’s foot remains firmly on the brake pedal, allowing the system to automatically pump the brakes. When your brakes lock up on wet, slippery, icy or snowy roads (or during a panic stop), you lose steering control, and your vehicle can spin. Rear wheel ABS prevents wheel lockup so that your car stays in a straight line. If your car has ABS control on all four wheels, you also keep steering control. If you have steering control, it is possible to avoid a crash by steering around hazards if a complete stop cannot be accomplished in time. Will I notice anything when the ABS is working? In many vehicles, drivers may experience a rapid pulsation of the brake pedal–almost as if the brakes are pushing back at you. Sometimes the pedal could suddenly drop. Also, the valves in the ABS controller may make a noise that sounds like grinding or buzzing. In some cars you may feel a slight vibration–this means the ABS is working. It is important NOT to take your foot off the brake pedal when you hear noise or feel pulsations, but instead continue to apply firm pressure. Does ABS change the way I should use the brakes? You should not pump your brakes if you have ABS. Just hold your foot firmly on the brakes pedal and remember that you can still steer. What ABS does is similar to a person pumping the brakes. It automatically changes the pressure in your car’s brake lines to maintain maximum brake performance just short of locking up the wheels. ABS does this very rapidly with electronics. Do cars with ABS stop more quickly than cars without? ABS is designed to help the driver maintain control of the vehicle during emergency braking situations, not make the car stop more quickly. ABS may shorten stopping distances on wet or slippery roads and many systems will shorten stopping distances on dry roads. On very soft surfaces, such as loose gravel or unpacked snow, an ABS system may actually lengthen stopping distances. In wet or slippery conditions, you should still make sure you drive carefully, always keep a safe distance behind the vehicle in front of you, and maintain a speed consistent with the road conditions. Brakes are among the most important systems in your car. They are not just parts-they are your safety system. Whether you drive an Audi, VW, Subaru, Toyota, Honda, Chevy, Ford, Dodge, car or truck-there’s a lot riding on your brakes. Understanding how they work will help you take the best care possible, meaning safe driving, and avoiding accidents. For Audi service and maintenance needs, GT Automotive has ASE certified technicians for all Audi model vehicles. Call us today, 801-302-0912, about servicing and/or repairing your Audi in Salt Lake City. The NHTSA (National Highway Traffic Safety Administration) states that Audi is recalling 2012 Q5 Audi models because of possible sunroof panels that may break under extremely cold temperatures (like our Utah winter climate). Audi Q5 models manufactured between June 21, 2011 and December 9, 2011 are the cars being checked out. A total of 13,172 Audi Q5s fall into this production date. Since nobody wants cracked or breaking glass in their sunroof, causing potential harm or damage to people or your Audi interior, take your Audi Q5 to the dealer to get this safety recall inspected and/or repaired. There have been no published instances of injuries or crashes to date. But the danger of cracked and falling glass to drivers and passengers makes this recall one you want to immediately take to the Audi dealership. The recall began in August. Audi says it will replace any defective sunroof glass at no charge to the consumer. Audi Q5 car owners may contact Audi directly at 800-822-8987. VOLKSWAGEN IS RECALLING CERTAIN MODEL YEAR 2012 AUDI Q5 VEHICLES, MANUFACTURED FROM JUNE 21, 2011, THROUGH DECEMBER 9, 2011. SOME VEHICLES MAY BE EQUIPPED WITH A FRONT SUNROOF GLASS PANEL THAT IS SUSCEPTIBLE TO BREAKAGE IN EXTREMELY COLD WEATHER/TEMPERATURE CONDITIONS. 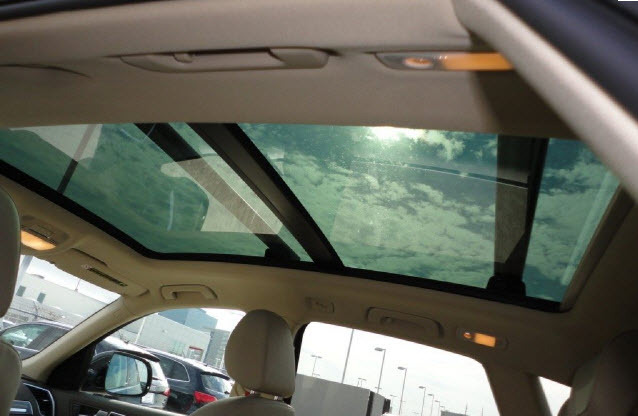 SHOULD THE SUNROOF’S GLASS BREAK WHILE THE VEHICLE IS IN USE, THE FALLING GLASS COULD CUT AND INJURE THE DRIVER OR PASSENGERS. IT COULD ALSO DISTRACT THE DRIVER, INCREASING THE RISK OF A CRASH. VOLKSWAGEN WILL NOTIFY OWNERS, AND DEALERS WILL REPLACE THE FRONT SUNROOF GLASS PANEL, FREE OF CHARGE. THE SAFETY RECALL IS EXPECTED TO BEGIN ON OR ABOUT AUGUST 7, 2012. OWNERS MAY CONTACT VOLKSWAGEN AT 1-800-822-8987. For all other Audi service and maintenance needs, GT Automotive has ASE certified technicians for all Audi model vehicles. Call us today, 801-302-0912, about servicing and/or repairing your Audi in Salt Lake City. Are you looking for that old fashioned neighborhood service auto repair shop, with dealership quality technicians and technology? Come to GT Automotive in South Jordan-your choice for the best of both worlds-dealer quality auto repair and honest, neighborly service. Watch this brief GT Automotive video, and take a tour of our car care facility-you will be impressed with our “Customer First” focus. Let Tim Stapleton, owner of GT Automotive, explain why we serve so many loyal auto repair customers in Salt Lake City since 1980. For complete auto repairs on Japanese cars like Subaru, Honda, Toyota, Lexus, and European cars like Audi and Volkswagen, GT Automotive in South Jordan has certified mechanics to repair any make and model car-import and domestic vehicles. With complete minor and major auto repair facilities, and full service oil change, express lube, safety inspections and emissions tests “Fast Lube” bays, we can serve every one of your auto repair needs. Call 801.302.0912 for auto repair and express oil change/emissions test information. We are your Subaru, Honda, Toyota, Lexus, VW and Audi car repair specialist in South Jordan, Utah.